The limitations of current gene editing tech may be overcome. Gene editing techniques hold great promise. They allow targeted and specific edits of genes, and have nearly limitless possibilities in the field of medicine. Which is not to say that they are perfect. These techniques still have a range of limitations, from precision to toxicity. But a new study shows that can be changed. In a study published in the journal Small, researchers detail the culturing and transfecting (injection) of cells with genetic material on an array of carbon nanotubes, which appears to overcome the limitations of other gene editing technologies. Using a process called chemical vapor deposition, the researchers created a structure akin to a honeycomb consisting of millions of densely packed carbon nanotubes, with openings on both sides of a thin, disk-shaped membrane. This structure was used to culture a series of different human and animal cells. After 48 hours, the cells were bathed in a medium that contained liquid DNA. 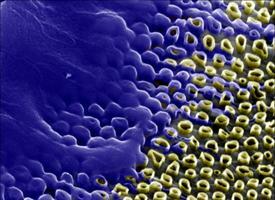 The carbon nanotubes acted as conduits drawing the genetic material into the cells. Using this method, the researchers observed that 98% of the cells survived and 85% were successfully transfected with the new genetic material. This technique allows one to overcome the many limitations of current gene tech. Current transfection technologies are time-consuming and limited by the size of genetic cargo, the inefficient introduction of test molecules into large populations of target cells, and the cytotoxicity of the techniques. These limitations restrict both the amount of genetic material that can be introduced into the cells and the amount of healthy cells left alive after undergoing the gene editing process (due to cytotoxicity, or poisoning of the cell). The high survival and transfection rates mean that the technique does not have these problems. How carbon nanotubes do this is still a mystery, but researchers suspect it may be via a process called enhanced endocytosis, a method by which cells transfer bundles of proteins back and forth through the cell membrane. The test used nucleic acids, but further development may allow drugs or proteins to enter the cells as well.